This news feature from the Thanh Nien News Daily features some of the lesser known – but no less impressive – artifacts from two millennia of Vietnamese archaeology. 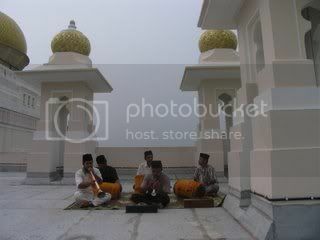 Nobat is a court orchestra played in Malay palaces as a symbol of power and sovereignty. No Malay sultan is legitimately installed unless he is drummed to the sounds of the nobat. Currently there are four nobat ensembles found in Malaysia, in the states of Kedah, Perak, Selangor and Terengganu. The other known Malay nobat which is still active is found in Brunei, a small oil-rich country sandwiched between the states of Sarawak and Sabah in East Malaysia. Nobat is also known to have existed in the ancient Malay sultanates of Pasai (now Acheh), Patani (Southern Thailand), Riau and probably other small provinces in Sumatera, Indonesia. Raja Iskandar, the author behind the blog is a researcher currently looking into the Nobat of the Perak Sultanate. I was first drawn to the site because of the mention about the Nobat in the Malay Annals, a valuable quasi-historical account about the history of the Malacca Sultanate. The site also features short video clips of the Nobat performances, which are very rare because such music is very ritualistic and considered sacred. 09 November 2006 (Thanh Nien News, Vietnam Net Bridge) – Craftsmen have cast a replica of the Ngoc Lu bronze drum. Not exactly archaeological news, but bears some potential for future experimental archaeology. The drum is 1.51m in face diameter, 1.54m in bottom diameter and 1.21m in height and it was cast in under eight months, said Hoang Van Thong, Director of the Hoang Long Antique Museum in Thanh Hoa. The drum will be displayed at the Hoang Long Antique Museum as of November 19, on the occasion of the inauguration of the museum. An exhibition of cultural artifacts of Vietnamâ€™s Central Highlands region opened Thursday in the resort town of Da Lat in Lam Dong province. On display are also a Dong Son bronze drum unearthed in Dak Lak province, and artifacts excavated at the archaeological sites of Cat Tien in Lam Dong, Bien Ho in Gia Lai, and Lung Leng in Kon Tum.